Sicily is famous for its beautiful, hand-made ceramics, and Caltagirone (KAHL-tuh-gee-RO-nee) is the most famous "city of ceramics" in Sicily. And, lucky for me, it is only about thirty miles from Sigonella, making it an easy shopping destination. CERAMICS R US! Everywhere you look, you see them. It's a hill town, and even driving up the hill to the town, there are ceramics decorating the walls. They are on buildings, on walls, in the Museum of Ceramics, and, of course, in hundreds of little studios and shops. Every piece is hand-painted, and many of them are also created in clay by hand. Everyone, I mean everyone, in Caltagirone seems to be an artist. It makes me wonder--is the art of ceramics-making genetic? LA SCALA! That is the name of my favorite restaurant in Caltagirone, but it is right on THE stairs (la scala). It's at the bottom on the right, as you head up. The stairs are extraordinary--worth a trip to the city even if you never buy a single thing! The official name of the 142-step monument is Staircase of Santa Maria del Monte, and it was built in 1608. The coolest thing is that the riser of each step is decorated with hand-decorated ceramics in different styles, old and new, by artists of the town. I have never been to this town when I didn't climb the steps. It's an activity that is physically demanding, shopping-productive (many shops on each side), and aesthetically pleasing. Coming back down with heavy packages is a challenge, but there is the restaurant La Scala waiting below. I always eat there and highly recommend it. It's decorated with ceramics, of course, but also has some archaeological interest (look through the glass-covered sections of the floor). The way to enjoy Caltigirone is just to wander, marvel, and take your time. There are so many workshops, shops, stores, and even a "supermarket" of ceramics, that you can never see them all. And each season, the designs and products change slightly. They make literally everything you can imagine in ceramics: tiles, figurines, pots, plates, tables, lamps, mirrors, kitchens, key holders, jewelry, and on and on and on. The dominant colors are blues and yellows. You can watch artists at work, often in the back room of a tiny shop. (Hint: If you see something you like in Taormina, look for the artist's name on the bottom of the piece and look him/her up in Caltagirone. Usually you can find them with Google. You'll save a lot of money this way.) I own a significant collection of Sicilian ceramics after just four years here. In addition, there are zillions of photo ops, Baroque architecture galore, churches, Italy's largest nativity scene (so they say), and glorious views of the surrounding countryside and Etna on clear days. This hill town is 600 meters high! Like so many good Sicilian towns, it was founded and named by the Arabs, inhabited by Greeks, Ligurians (northern Italians), Byzantines, Normans, and a few others. There is a definite influence by each of these in the designs of the ceramics. See more PHOTOS here. The Museum of Ceramics may be interesting to artisans and perhaps historians. I found it to be not very interesting. Lots of dusty pots. However, the building itself and the surrounding park, which is decorated with ceramics, is very nice. Credit cards are pretty much accepted everywhre, but there are ATMs all over town. Good thing. I just came across your blog and LOVE IT! From what i've read so far you are a middle school teacher in Sicily. Are you teaching English? What are you doing there and how long is your stay? 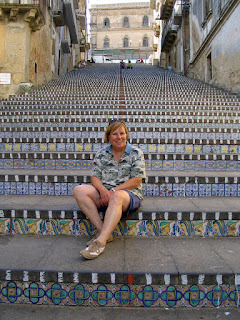 Caltagirone was our favorite city in Sicily! !Even took a ceramics demo while there! !Beautiful beautiful things! I love your blog, it takes me back to when we were stationed at Sigonella. I cherish those memories, and thank you for bringing them back! My wife is Sicilian (from Catania) and I love the Sicilian ceramics and we brought some back to the UK. Great blog by he way. I enjoy reading it! Think your gas is expensive?